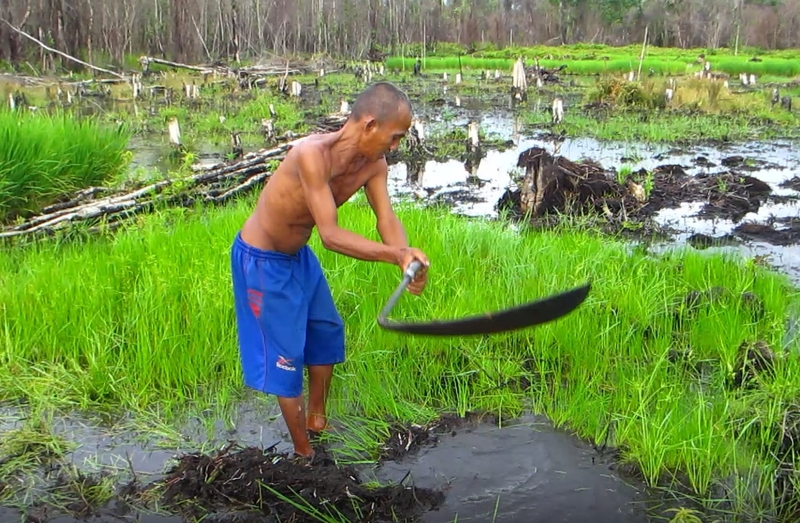 Cut down grass with unique long knife called Tajak to soak them in water for a while for preparing rice planting at the lower part of the river in Central Kalimantan, Indonesia. People in Southeast Asia have had a long history of human-nature interaction. A word of “people”, however, has different types of meanings on human, which includes an individual, a group as an assembly of individuals, and society. In order to understand human-nature interaction, it is important to clarify on what “people” means. In another word, it is necessarily not only to understand how an individual or a group interacts with nature, but also to do how a society supports a basis, on which people interact with nature and how people interact in a society, because people’s interaction with nature might be different if there is socially-supported infrastructure or not, and it might have been different historically. This study, therefore, aims to understand human-nature interaction by focusing on how socially-supported infrastructure has historically constructed and how it affects current interaction. 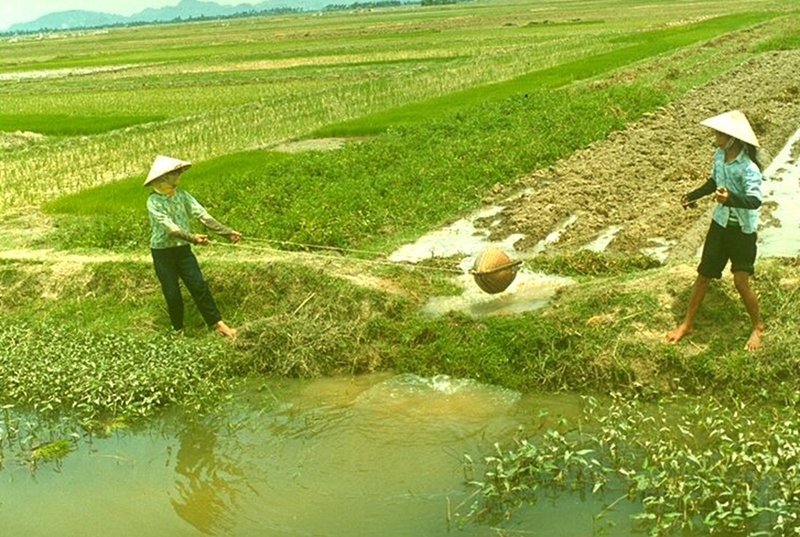 In general, Vietnam has had a tightly structured society especially in the rural area. Since the WWII, Vietnam has experienced turbulent history, including rapid socialization, several times of war, intrusion of market economy, and rapid economic growth. During this period, the tightly structured society sometimes supported to protect villager’s life and sometimes stagnated the changes, in addition, it was also reorganized in the history. This study aims to clarify roles of the tightly structured society in the rural Vietnam under the current global world and to understand its implication in the long history of Vietnam. 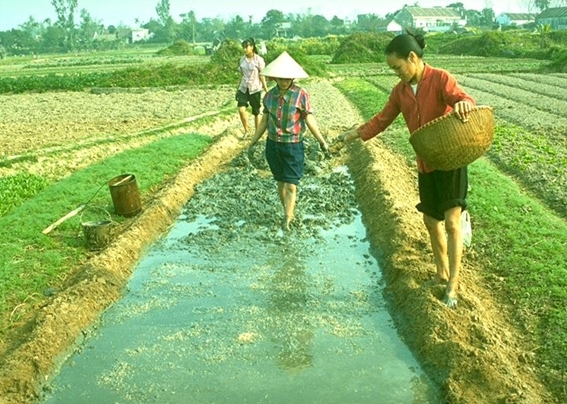 Making nursery on muddy bed carried from the lowland field to successfully cultivate rice in Spring season with low sunlight condition in the Red River Delta, Vietnam. Swing basket called tat nuoc seems to be a labor-intensive technology, but they are rhythmically swing the bamboo basket with chatting. Photo in the Red River Delta, Vietnam. 8. Kono, Y.; Yanagisawa, M.; and Dang The Phong 2002. “Quản lý cộng đồng các hệ thống thủy lợi ở châu thổ sông Hồng, Việt Nam”, In Các nhà Việt Nam học nước ngoài viết về Việt Nam tập 2, edited by Phan Huy Lê. pp.323-334. Hanoi: Nhà xuất bản thế giới. 9. Yanagisawa, M. 2003. “Agricultural intensification and diversification in the Northern mountains region of Vietnam”, In Cultural diversify and conservation in the making of mainland Southeast Asia an Southwestern China regional dynamics in the past and present, edited by Hayashi, Y.; and Thongsa, S. pp.379-393. Bangkok: Amarin Printing and Publishing Public Company Ltd.
10. DiGregorio, M.; Rambo, A. T.; and Yanagisawa, M. 2003. “Clean, green, and beautiful: Environment and development under the renovation economy”, In Postwar Vietnam: Dynamics of a transforming society, edited by Hy Van Luong. pp.171-200. Maryland: Rowman & Littlefield Publishers, INC.
13. Yanagisawa, M. 2004. 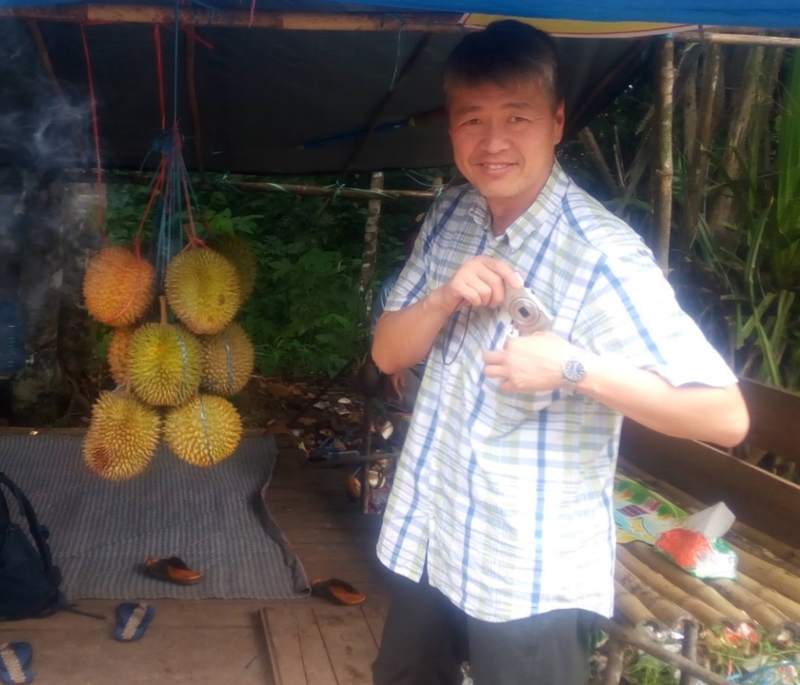 “Development process of cash crops in the Northern mountains region of Vietnam: A case study in Moc chau District of Son la Province, Vietnam”, In Ecological destruction, health, and development: Advancing Asian paradigm, edited by Furukawa, H.; Nishibuchi, M.; Kono, Y.; and Kaida, Y. pp.467-479. Kyoto: Kyoto University Press. 15. Nghiem Phuong Tuyen, and M. Yanagisawa. 2008. “Qua trinh phat trine mang luoi thi truong tai mot huyen vung nui phia bac viet nam,” In Thoi ky mo cua nhung chuyen doi kinh te – xa hoi o vung cao viet nam (Socio-economic changes in the time of open in Vietnam highland), edited by Sikor, T., Sowewine, J., Romm, J., and Nghiem Phuong Tuyen. pp. 117-133. Hanoi : Nha xuat ban khoa hoc va ky thuat. 19. Dao Minh Truong, Masayuki Yanagisawa, Yasuyuki Kono. 2017. “Forest transition in Vietnam: A case study of Northern mountain region,” Forest Policy and Economics. 76 (2017) 72-80. After the World War II, overseas field studies became popular and area knowledge was accumulated in various format of fieldnotes written by researchers. This project aims to share records written in fieldnotes in order to reconstruct the history of human-nature relation in Southeast Asia. Under the project, Takaya Yoshikazu Fieldnotes Database was visualized on web-based mapping system as a proto type of the Field Database (in Japanese). The Bach Coc Project, which was initiated by the late professor SAKURAI Yumio, the University of Tokyo, in 1994, is an interdisciplinary study in one village of the Red River Delta, Vietnam. This project has conducted a socio-economic survey at one hamlet in the village every five years since 1995. We try to construct a Long-term Village Study Database in Vietnam to understand changes in village life not only in Vietnam but also in Southeast Asia and the other area of the World with comparative perspective. This is a voluntary association, which was manly consisted of young researchers and graduate students, to conduct a field survey to learn methodology of field study and to have academic experiences in the different field and study site from which the participants currently conduct by themselves. Annual challenge depends on what participants’ needs and interests in each year, for example, it was “Holistic Approach to Maritime Society in Sulawesi, Indonesia” in 2017. See the following URL for more information (in Japanese).